Very simple wedding card today and Yes, that is glitter adorning the bride's gown and veil. Glad I glittered this in my previous apartment and left the residuals behind! The scallop, bride and groom and sentiment are all from A muse. 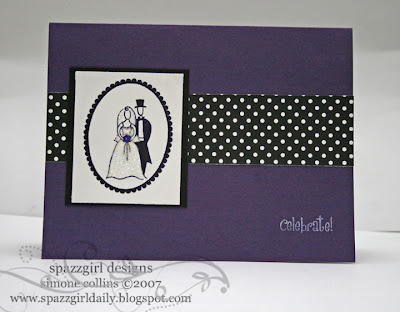 The polka dot paper is from Doodlebug and it is hard to tell but the card is actually deep purple. I added purple stickles to her bouquet as well but you can't really see that either. Amuseapalooza is coming to an end, or beginning, depending on how you look at it. So you may be seeing less A muse stamps in weeks to come, but hopefully my new Stampin' Up© stuff will be here soon and I can start playing with that. And maybe, one day, I may actually get a catalog and see what that's all about...Geesh!! Excellent! I need to get on my wedding cards - thanks for the reminder!